Bodybuilding Nutrition 101 discusses how to improve your physique through clean eating, but eating the right kinds of foods just isn’t enough when it comes to getting your physique stage ready. This article’s sole purpose is to help get you lean as possible without sacrificing any of your hard earned muscle mass. There are magnitudes of approaches and strategies when it comes to contest dieting and training so make sure you incorporate these principles to retain your muscle. A caloric deficiency is created when the amount of food energy (calories) eaten is less than the total calories you burn. Typically, the dieting stage lasts anywhere between 12-20 weeks depending on the individual and the caloric deficiency. One should give themselves adequate time to lose enough body fat to look stage ready. For example, a leaner individual might only need 12 weeks to reach 4% body-fat whereas an individual with a higher body-fat might need 20 weeks to attain the same goals. The latter individual could lose the weight in 12 weeks by restricting a significant amount of calories, but low calorie and crash diets have been associated with the loss of lean muscle mass1. 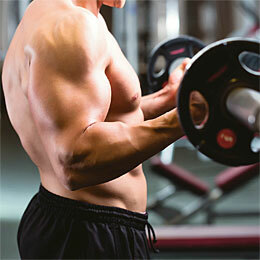 In order to preserve muscle mass and lose fat, dieting must be done slowly and over time. Creating a caloric deficiency of 500-1000 calories daily via diet or exercise will result in weight loss of 1-2lbs per week and preserve muscle if adequate protein is provided2 (See Bodybuilding Nutrition 101 for protein requirements). Sometimes throughout the course of diet fat loss seems to stall, despite a consistent caloric deficit. A potent fat burning hormone secreted by fat cells called leptin3 is the culprit of this phenom. During the dieting stage, as body fat drops leptin levels also drop in order to spare body fat4 causing your progress to stall. However, you can combat this situation by incorporating a controlled higher calorie day (re-feed) weekly or bi-weekly into your pre contest diet. Not only does a re-feed day boost your leptin levels4, it refills depleted glycogen stores and helps provide a psychological break from dieting. Then again, this isn’t a cheat day and doesn’t give you an excuse to eat whatever you want. On your re-feed days, stick to clean calories and strive to increase your calories to the point where you’re no longer in a caloric deficient state (500-1000 calories). By dieting slowly over time, incorporating weekly or bi weekly re-feed days, and maintaining your exercise intensity in the gym, you’ll be able to shred fat, keep your hard earned muscle, and have a stage worthy physique. 1^ Strychar I (January 2006). “Diet in the management of weight loss”. CMAJ 174(1): 56–63. doi:10.1503/cmaj.045037. PMC 1319349. PMID 16389240. 2^McMaster University (2011, August 29). Foods rich in protein, dairy products help dieters preserve muscle and lose belly fat.